In the third gaming-only CustomPC and bit-tech podcast we talk about the theory behind OnLive, Sony's new PlayStation 3 reality TV show 'The Tester' and the controversies that have broken out around Valve's new anti-cheat measures in Team Fortress 2. Moving on from that we recap on what we've all been up to lately, from playing with the Novint Falcon to taking a look at the much-delayed Battlefield 2 patch. Click the links below to listen to the gaming podcast! On top of all that we discuss what the difference is between someone who delivers packages and someone who cooks curry for a living, why wolves are exciting and why we should never record a podcast before lunch. Alex and Joe also narrowly avoid coming to blows when discussing The Beatles: Rock Band. 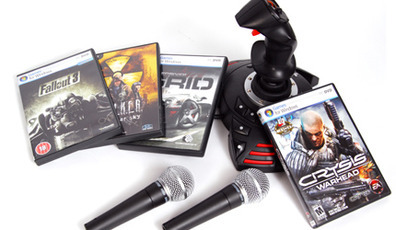 We've also got all the usual prizes and competitions, plus we're asking you all for questions and ideas to be featured in the next gaming podcast - so send your queries to Podcast-at-CustomPC-dot-co.uk, or simply drop them in the comments thread if you haven't got the hang of all this 'email' malarkey just yet.